Just use Petacc water-absorbent microfiber towel to dry your pet comfortably and quickly! Soft Comfortable- Well crafted with soft microfiber, brings ultra comfortable use experience. High Performance- Equipped with strong water-absorbent and fast-dry feature, works perfectly for making your pet dry quickly; besides, super easy to be washed by machine. 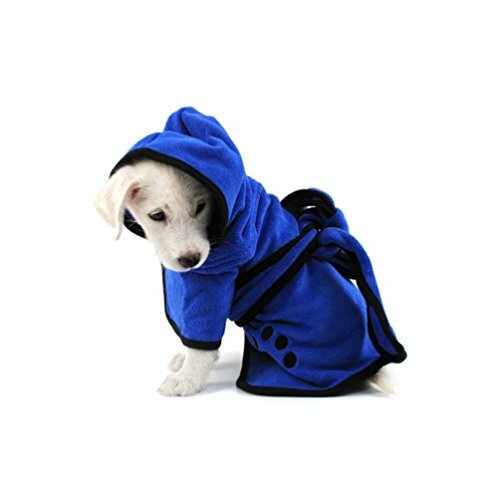 Multi-purpose- Performs as a wonderful bathrobe, also as a powerful drying towel to avoid wetness on your pet's skin and hair. Velcro Strap- Provides extra convenience for you to put on and take off for your pet. Warm Notice- Please measure the back length of your pet and refer to our product's size chart before buying.